Reducing life to its lowest terms, in the industry and on the road. This is my first post in this vein, but it’s my intention to occasionally review books and music that I think are worth your time. In this instance, I’d like to introduce you to Engine. Not only are they excellent people, their band is one of the finest I’ve encountered on the road. Check out my take on their new record, Red Moon Rises, here. Louisiana is a state often associated with swamp music. The Delta blues. Zydeco and Cajun. Space-Western. Wait, what? Engine, local indie rock heroes of the small-but-proud community of Shreveport, LA, have returned with their most ambitious studio endeavor to date and cover new ground for their geographic reputation. Frontman and primary songwriter Landon Miller has explained Engine’ genre as such: “If someone looks like they really know music or genre fiction, I tell them it’s space-western. If not, I just say indie-rock.” But in either rendering of the specificity of their branding, Red Moon Rises proves to be an intricately composed masterpiece of textural storytelling with just the right splash of nerd factor. Opener “Count Your Cards” commences with baritone guitar riffs fuzzed beyond recognition like a Southwestern Surfer Blood while Miller’s desperate-sounding, Oberst-esque vocals warble, “You gotta let it on down/crawling through a deep black space/there’s blood on the ground and your face/yeah, your face is gettin’ to your head.” This is a fine example of the lyrical content that Moon serves up with quick and understated cleverness. The adventurous moxie surges forward with “If Somebody Gives You a Hand” with contrapuntal guitar riffs that sound like a hybrid between a sea chanty and Halloween. The mathy/nerd factor—8-bit Nintendo arps and percussive triplets against a duple meter—is tempered by a barroom singalong. Miller explains the role of the guitar in his paradigm as utilitarian: something at which he needs to be proficient only enough to write songs. However, whether it’s his humility or bandmate Ben Densmore’s lead guitar prowess that negates his modesty, make no mistake that this is a guitar record. Whether in the staccato, Jet-like swagger of “Ten Step” or the county blend of slapback delay and bottleneck slide that mark “Patraeus,” competency and chemistry are both manifested throughout on their dueling six-strings. It’s also just obvious that these guys love being in the studio. Vocal allusions to M. Ward’s scoops on “Shuffle” are shaded by gentle harmonies from collaborator Chelsea Norman and the song also manages to work in an accordion without sounding kitschy. “I’m Not Angry” starts like a normal-folk folk song with a little alternating octave riff, but jangly secondary dominants and leading tones break the mold without wasting time. Between vibe pedals and minor third pull-offs, the appropriately-titled “High Noon” sounds like the soundtrack to a revamped Old West shootout. “Sweet ol’ Susannah/you were the horse I rode in on/you were the grace that I fell from/you’re gonna wish me well” is the pre-chorus of lead cut “Red Moon Rises,” with grace notes of Arcade Fire. Handclaps, tambourine, and quarter-note bass-rock pulsate through “Starting Over” and it almost sounds like a Brian Setzer B-side. Then “Spare Parts” is tacked haphazardly on to the end, but what engine doesn’t benefit from spare parts? The evocative lines “wash me in war paint and holy water/lay my sweet head down upon the altar/I know that there’s a ram out there” are underscored by am alternately-tuned acoustic guitar. The striking dissimilarity of these elements and the vibrato whistle solo create a perfect capstone to the record as a whole. It’s like an image in the same installment, painted now in conclusion with watercolors instead of oils. 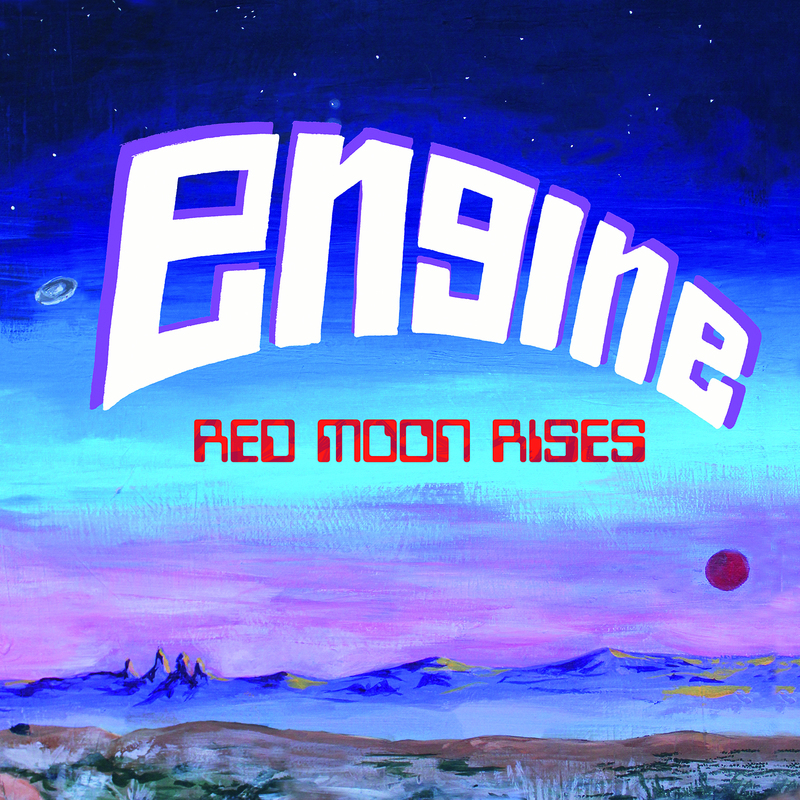 Engine has been a staple in Shreveport since 2010, but the band considers Red Moon Rises their crowning achievement so far, and no one seems to be arguing the point. We can just hope that the band will have the grit to back up their artistic accomplishment with the steel it takes to evangelize their band to a broader audience with their strange gospel of spurs in Martian dust and gunfights in space.